The (O)Hehir clan have, for centuries, been established in the ancient territory of Thomond or Tuathmhumhan, comprising most of Co. Clare with adjacent parts of Counties Limerick and Tipperary. The name is an Anglicized form of the Old Gaelic "OhAichir", the Gaelic prefix "O" indicating "male descendant of", plus the personal byname Aichear", from "aichear", fierce, sharp. Traditionally, Irish family names are taken from the heads of tribes or from an illustrious warrior, and are usually prefixed by "O", descendant of, or "mac" denoting "son of". The main stronghold of the name today is Co. Clare in the heart of Thomond, and the form "Haier" found in West Clare is a synonym of (O)Hehir. 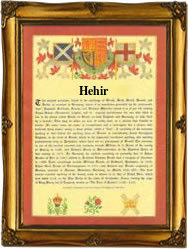 Further Anglicized forms of the name include: Hegher, (O)Hare, and Haire. Hare is, however, more usually from "O(F)hir", an Oriel or Co. Armagh sept name from "fior", figure, image, and Haire may also derive from this Ulster source. The English surname Hare, recorded as early as 1166 in the Pipe Rolls of Surrey, has a totally separate origin, being a nickname from the Middle English "hare", hare. On May 22nd 1721, John, son of Daniel Hehir, was christened at St. John's, Limerick, and on March 6th 1832, Bridget Hehir married a James O'Halloran in Doora and Kilraghtis, Co. Clare. The first recorded spelling of the family name is shown to be that of George Haire, which was dated September 28th 1652, marriage to Catherein Locke, at St. John the Evangelist, Dublin, during the reign of Oliver Cromwell, known as "The Great Protector", 1649 - 1658. Surnames became necessary when governments introduced personal taxation. In England this was known as Poll Tax. Throughout the centuries, surnames in every country have continued to "develop" often leading to astonishing variants of the original spelling.